My love for you is like the whole carousel of Crayola colours. Nothing beats Crayola if you ask me. The company has been around for over 100 years and is known the world over. They must have a Product Development Officer that is a mum. There’s Changeables, Mini Stampers, Erasable Crayons, Twistable Crayons, Sidewalk Chalk, Dry Erase and so many more. They are versatile, fun, vibrant and quality products that are well and truly loved in our household. Many a colouring in competition has been entered (and some won) after using a packet of these perfect drawing companions. Masterpieces have been procured and displayed on the fridge of fame. Hours of colouring, drawing, tracing, patterning and creating takes place here each week. They are sunshine on a rainy day. They turn the ordinary into extraordinary. They bring imaginations to life on a page, wall, carpet, concrete, mirrors and even skin. Yes, the humble Crayola gets put through its paces with my boy-o’s. My eldest attempted to be Picasso on one of the white walls in the loungeroom when he was younger. Not wanting to be outdone, my youngest has strived to surpass his brother in the making of colourful creations on any surface imaginable. My love for them really comes into play when my desire for clean necessitates the removal of marks made on surfaces they’re not designed for. To date, I have not not been able to remove the innovative ink from anything. Sometimes all that’s needed is a wet cloth. On trickier items some orange oil and a little bit of elbow grease is required. Skin needs a good soaking in the bath and there you go. Job done. The Crayola company is renowned for its range of products. 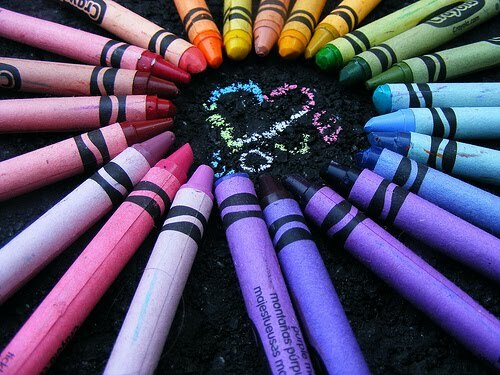 My hope is to be renowned for my ability to show you I love you in as many ways as there are shades of crayons (if not more). If you’ve found yourself with a Crayola conundrum I’d invite you to leave your mark below. I love you and all the Crayola hues.